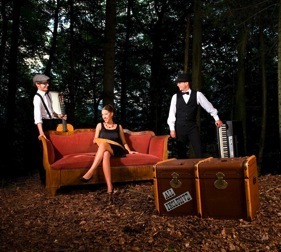 Tangora Trio is a music group from the French-speaking part of Switzerland. Jeanne Gollut plays the pan flutes, Thierry Raboud the guitar and Raphaël Ansermot the piano. Their repertoire is designed to be festive, colourful and wide. It mainly consists of jazz standards and folkloric works from different continents. The musicians arrange in their own way folkloric melodies from South America (Argentinians tangos, Brazilian choro compositions), from the Balkans (Hungarian, Romanian or Russian popular tunes), klezmer music and various jazz standards. The sonorities of the pan flutes, the guitar and the piano fit perfectly together. The three artists serve the music with great talent. 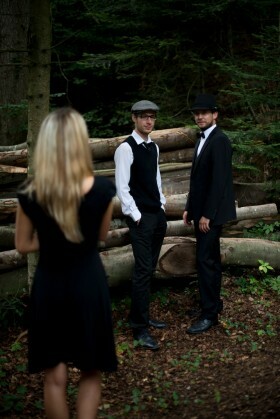 Tangora Trio was created in 2008. The concerts’ success and the audience’s enthusiasm have led the musicians to record their first album in August 2010. Called Tangora Trio: All Inclusive, it was released on the 19 December 2010 and was a complete success. After a couple of years of intensive work on a new repertoire, the trio released its second record, First Class, in April 2013. This album too will have a bright future for sure! Jeanne Gollut obtained an education diploma as well as a virtuosity diploma from the Lausanne Music School. She regularly performs concerts in various groups of chamber music and teaches pan flutes at the Vevey Music Conservatory. She is determined to valorise the image of her instrument, and she therefore works so that composers and the public know more about the Pan flutes. Raphaël Ansermot obtained a senior certificate of piano from the Vevey Music Conservatory in 2015. During his musical education, he has also attended the Montreux Jazz School for 9 years. This eclecticism allows him to integrate diverse music groups, and more specifically to accompany choral groups. Thierry Raboud obtained a senior certificate in classical guitar from the Vevey Music Conservatory in 2011, and he has spent three years in the professional section of the Lausanne Music Conservatory. After that, he furthermore obtained a Master of Musicology from the University of Fribourg while participating in various music groups.